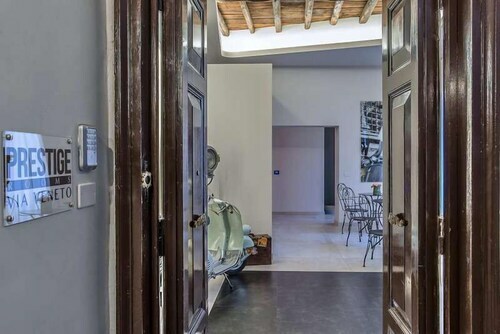 Located in Rome City Centre, this bed & breakfast is steps away from Piazza Barberini and Via Veneto. Trevi Fountain and Via Nazionale are also within 10 minutes. Barberini Station is only a 2-minute walk and Repubblica - Opera House Station is 9 minutes. Free breakfast and free WiFi in public areas are available at this bed & breakfast. All 5 rooms offer free WiFi, minibars and flat-screen TVs. Guests will also find electric kettles, hairdryers and laptop-compatible safes. Guests can enjoy a complimentary breakfast each morning. Public areas are equipped with complimentary wireless Internet access. Start your day with a free continental breakfast, available daily from 7:30 AM to 10:30 AM. All guests, including children, must be present at check-in and show their government-issued photo ID card or passport. Cash transactions at this property cannot exceed EUR 2999.99 due to national regulations. For further details, please contact the property using the information in the booking confirmation. Children aged 12 years old and younger are not permitted at this property.